In the metropolitan region of Hamburg, the European XFEL, the biggest X-ray laser in the world, has reached the last major milestone before the official opening in September. The 3.4 km long facility, most of which is located in underground tunnels, has generated its first X-ray laser light. The X-ray light has a wavelength of 0.8 nm—about 500 times shorter than that of visible light. At first lasing, the laser had a repetition rate of one pulse per second, which will later increase to 27 000 per second. View into the 2.1-kilometre long accelerator tunnel of European XFEL with the yellow superconducting accelerator modules hanging from the ceiling. 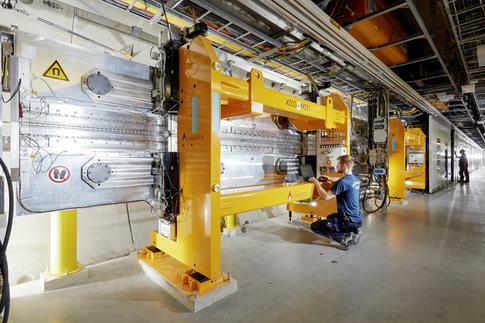 Helmut Dosch, Chairman of the DESY Directorate, said: "The European X-ray laser has been brought to life! The first laser light produced today with the most advanced and most powerful linear accelerator in the world marks the beginning a new era of research in Europe. This worldwide unique high-tech facility was built in record time and within budget. This is an amazing success of science. I congratulate all those involved in the research, development, and construction of this facility with passion and commitment: the employees of DESY, European XFEL, and international partners. They have achieved outstanding results and demonstrated impressively what is possible in international cooperation. The European XFEL will provide us with the most detailed images of the molecular structure of new materials and drugs and novel live recordings of biochemical reactions." 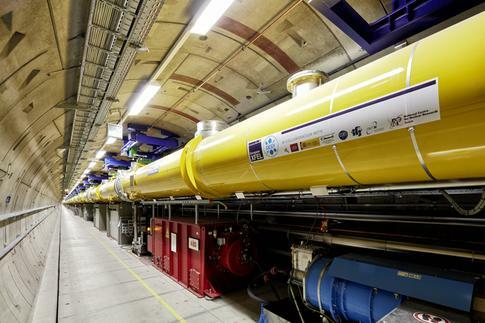 The X-ray laser light of the European XFEL is extremely intense and a billion times brighter than that of conventional synchrotron light sources. The achievable laser light wavelength corresponds to the size of an atom, meaning that the X-rays can be used to make pictures and films of the nanocosmos at atomic resolution—such as of biomolecules, from which better understandings of the basis of illnesses or the development of new therapies could be developed. Other opportunities include research into chemical processes and catalytic techniques, with the goal of improving their efficiency or making them more environmentally friendly; materials research; or the investigation of conditions similar to the interior of planets. UndulatorâLast preparations at the undulator in the tunnel, the structures that generate the X-ray radiation. The X-ray laser light of the European XFEL was generated from an electron beam from a superconducting linear accelerator, the key component of the X-ray laser. The German research centre DESY, the largest shareholder of the European XFEL, put the accelerator into operation at the end of April. In a 2.1 km long accelerator tunnel, the electron pulses were strongly accelerated and prepared for the later generation of X-ray laser light. At near-light speed and very high energies, the intense electron pulses entered a photon tunnel containing a 210 m long stretch of X-ray generating devices. Here, 17 290 permanent magnets with alternating poles interacted with the electron pulses from above and below. The magnetic structures, known as undulators, bring the electrons into a “slalom” course, and with every turn they release extremely short-wavelength X-ray radiation, which intensify across the length of the undulator stretch. For the first lasing, the X-ray light was absorbed and measured shortly before arriving in the underground experiment hall. The 3.4 km long European XFEL is the largest and most powerful of the five X-ray lasers worldwide, with the ability to generate the short pulses of hard X-ray light. With more than 27 000 light flashes per second instead of the previous maximum of 120 per second, an extremely high luminosity, and the parallel operation of several experiment stations, it will be possible for scientists investigate more limited samples and perform their experiments more quickly. Therefore, the facility will increase the amount of “beamtime” available, as the capacity at other X-ray lasers worldwide has been eclipsed by demand, and facilities have been overall overbooked. At the start of September, the X-ray laser should officially open. At that point, external users can perform experiments at the first two of the eventual six scientific instruments.